It seems to be such a marvelous rocket engine. A high thrust to weight, high ISP high tolerance design that is still top of the line after sitting forty years in storage – it will be used for Orbital’s Taurus II as a first stage engine. I drew a diagram on how the engine works internally. It’s a full flow oxygen rich staged combustion design. Also note that there’s a separate geared booster pump to raise the pressure of the small fraction of kerosene going to the gas generator. This is most likely because the turbine lowers the pressure, hence the gas generator has to be at a much higher pressure than the chamber. In the modern launcher business, Russia probably still has the best expertise on first stage engines. With a modest chamber pressure, the full flow oxygen rich gas generator gas wouldn’t need even to be that hot. I don’t know why specifically these kinds of engines have not been tried more often. Maybe SpaceX can do something, they’re one of the few companies designing new engines anymore. This is the logical path after gas generator engines. Remember that perhaps the best known GG engine, F-1, originated from around 1958… It could be seen as an anachronism that the US companies are still sticking to gas generator cycle engines. With modern day machining capabilities and turbine / pump computer optimization, one should be able to do quite a lot relatively easily. Source for the data that I made the graphic with: Liquid Propellant Rocket Engines, lpre.de, in Russian. Many features of this type lend themselves to small, high thrust/weight designs. I wonder how low in scale can you go with a staged combustion engine? Since small engines have more surface area compared to propellant mass flow, expander engines could produce pretty high pressures already? And AFAIK in small scale, turbines work badly, though I don’t know how small. Didn’t some Soviet air to air missiles have turbopumps? How small? If not concerned with achieving 250 bar like in RD-170, very small. One cm turbine dia, and thrust under 1000 N (220 pounds), or maybe even 100 N.
If the objective is a chamber pressure of 5 to 30 bar, it will work well for an upper stage engine. 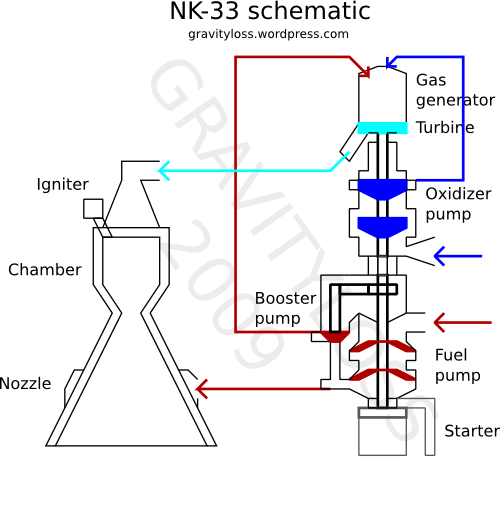 I have been working on this design, to use O2 temperature of from room temp (300 K) to 600 K.
Others have not been trying this because most organizations which do have a high overhead cost, and a general belief that turbopumps are very complex. 100 N? For a T/W of 1 in one gee that’s for a 10 kg rocket. You’re up to minimum gauge issues then and could just use a blowdown pressure fed system. I was thinking 10 000 N in the least, probably more like 100 000 N.
Even drag losses are going to be huge for the tiny launchers. The Soviet S-25 surface to air missile was telephone pole sized and the liquid engine had around 90 000 N of thrust. 1 cm turbines sound tiny. Wouldn’t all the flow just go by the tips and the efficiency would be low. Perhaps 10%? Wikipedia says the MIT microturbine has an efficiency around 3-5 % though it is still much smaller. A 5 tonne = 5000 kg launch vehicle, with a T/W of 2 at takeoff needs 100 000 N of thrust. With an exhaust of 2500 m/s that’s that’s a mass flow rate of 40 kg/s. If we assume a density of 1000 kg / m^3 that’s 0.04 cubic meters per second and a pressure of 30 bars = 0.3 Megapascals = 300 kPa and thus that’s a power of around 12 Kilowatts. I sometimes thought of pressure washers but discovered their flow rates are really low. If a cheap large piston gasoline engine powered pressure washer pump can pump 0.6 kg/s, that would enable only a 1500 N thrust and hence a 75 kg launch vehicle. Yet the pressure washer weighs more than that. Of course, they are not weight optimized systems. Still..
Or assuming a 50% pump efficiency, a 500 cc motorcycle engine producing 24 kW. In my calculations for a 10 KN (about 1 metric ton) engine and a chamber pressure of maybe 33 bar (3.3 MPa), a turbine efficiency of 50% and LOX pump efficiency of 30% should be attainable. I have been assuming a radial turbine, as they are somewhat more efficient than axial in small sizes. A friend made on his CNC mill a sample in aluminum that was 32 mm diamer, 3 mm thick and weighed 4 grams. This would be about right for about 5-6 KN. I found by calculations that the threshold for product of turbine x pump efficiency needs to be over 5% (that’s all). That product for the RD-170 is 58%, but it is achieving a chamber pressure of 250 bar (25 MPa). Any pressire over 1 MPa is useful for a starting point. The smallest engine I am contemplating would be about 1000 N.
10 kN? That’s probably very close to Armadillo’s current engines. I think aerodynamic losses will be a severe problem at that scale because the frontal area is huge compared to the volume. Or alternatively, drag loss is inversely proportional to rocket length, to a first approximation. Maybe a sounding rocket style long thin shape. I don’t know what kind of performance a super mod would have as a first stage… a 180+ s hover suggests 1.8 km/s class delta vee. (But with a very small payload). Drag would lower this, though ISP gain at altitude would compensate somewhat. Also there’s a question of reuse and landing. Maximum Q was to be controlled via a pitot tube to 33 KPa, 450 KIAS; 20 KPa, 350 KIAS; or in #1 no limit. The stage is to use irrigation tubing and an engine pressure of 10 atm. Isp would be 220 at liftoff, rising to 250 at altitude. The 1st stage was to have an empty mass of about 14 kg and the 2 upper stages 10 lg. I did design, had static tested an irrigation tube rocket back in 1993-5. It works. 2 pictures on the “SA-05” part of the website. For N Prize, and the follow on ML-1, to use 8 inch dia and a GLOW of 100-200 kg for escape I will be seeking partners for the work. Most likely in Las Vegas area but could be anywhere but California. Help in organizing, finding sponsors etc also needed. This will be a very small budget, simple undertaking. What are the drag losses in m/s? Drag loss: the calculations were done by a spreadsheet based program that computes net acceleration with the drag on a step by step basis, without separately calculating the drag soss separately. You can estimate it by assuming an average Isp of 240 (it’s near the 220 sea level value only briefly) and the mass ratio of 2.5, then subtract the gravity loss during the burn (77 sec for T/W = 2; 66 sec for T/W = 3. I’ve never considered it important to see that figure separately, rather the estimate of performance. This will be verified in a number of test flights of 1st stage only, using the US amateur rocket regulations. The Reynolds number is in the calculation. In any case, for rockets this small, the first stage is mainly to get the 2 upper stages to a vacuum, and nearly all the flight velocity is developed by the horizontal component of the upper stage thrust. In a vacuum, rockets of 10-100 N thrust are nearly as efficient as larger ones. The math has been checked enough for there to be confidence, so the next steps are to gather the means to build–the “Location-1 through 3” as mentioned in the N Prize presentation in the site. I get 1402 m/s delta vee (gravity loss is subtracted) from the mass ratio and v_ex, that would mean only 170 m/s drag loss, it seems quite small to me! The transonic c_d is quite large, John Carmack approximated it by just looking at the V-2 experimental data from Sutton. Maybe you are right anyway. Have to build a simulator again some day, had one written in Python on a memory stick that of course broke down.